Flight diversions due to inflight medical emergencies make up a tiny portion of the millions of flights operated annually, but it is costly for airlines. With more people traveling by air, the actual number of inflight medical events has been gradually increasing over the years. Emirates, the largest airline by international traffic, operates over 3,500 departures a week, or more than 194,000 flights in 2016. In those 12 months, the airline handled more than 60 flight diversions due to medical emergencies. A single flight diversion can cost Emirates anything from US$50,000 to over US$600,000, depending on the nature of the diversion which include fuel, flight catering, landing and ground handling fees, air navigation cost, passenger rebooking costs and onward connection, as well as other associated costs to care for crew and passengers. In 2016, Emirates delivered nearly 23,000 hours of medical training for cabin crew and pilots, ensuring they are ready to assist passengers on board. All Emirates cabin crew go through a comprehensive initial training programme which is required by the UAE General Civil Aviation Authority, recurrent training to keep their skills up to date, as well as additional specific training for the use of on board medical equipment. 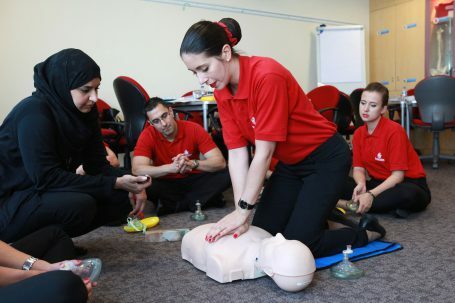 The medical training that Emirates cabin crew undertake includes both theory and practical aspects. It prepares them to recognise and deal with common situations, but more importantly handle rare but life-threatening events when time is of essence. Topics covered include basic life support (CPR); medical conditions including asthma, heart disorders, seizures and allergic reactions; trauma related topics and even emergency childbirth amongst others. Pilots also attend training sessions covering topics such as Hypoxia, Malaria, Dengue, Trauma, CPR and choking and occupational health issues. Emirates has also invested more than US$ 7 million in the installation of its medical equipment on board, with annual maintenance costs being a further US$ 1.7 million. Equipment on every Emirates aircraft include: emergency medical kits, oxygen bottles, resuscitators, a defibrillator, a telemedicine unit, and a 24/7, satellite medical advisory service that connects crew to specialist aviation medical consultants who can help assess the passenger’s situation in real time. On average, Emirates’ crew make about 20 calls to the medical advisory service per 100,000 passengers flown. Most calls do not result in a diversion, but the professional consultation helps the operating crew to make better decisions and offer the right support to the affected passengers, particularly when there are no volunteer medical professionals on the flight. Emirates’ in-house team of aviation medical specialists, flight planners and operations controllers, all work closely to conduct detailed scenario planning and regular updates to diversion protocols – in keeping with the airline’s growing global network, as well as advances in medical thinking, inflight medical technologies, and training techniques.